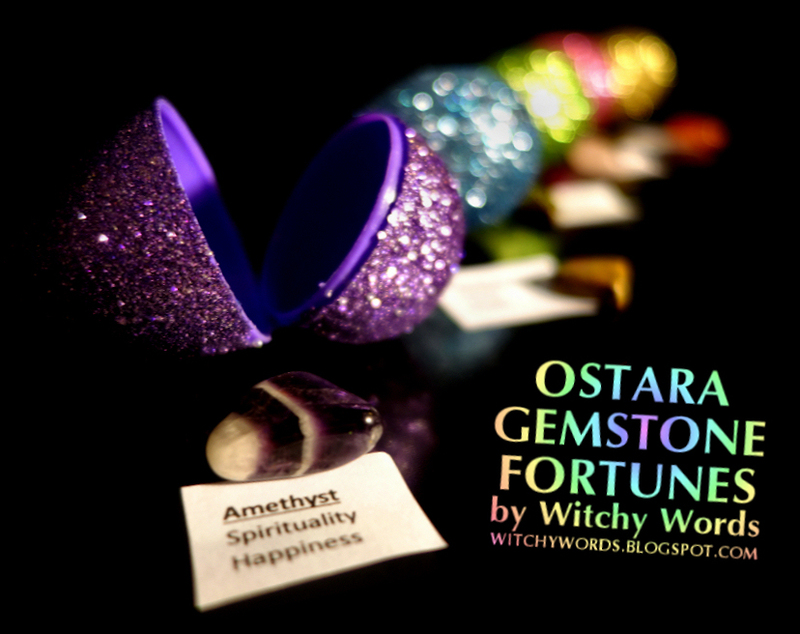 One of my most popularly shared images from last year's Spring Equinox / Ostara ritual is the segment about my Ostara gemstone fortunes. This year, I'm bringing them back for my new circle's Ostara ritual and I thought I'd elaborate a bit on just what I do! I start by grabbing colored plastic eggs from my local grocery store. Any kind will do, but I'm particularly attracted to bright pastel colors and glitter. Last year's eggs were no different! I also make a drop by my local metaphysical store and pick up some smaller common semi-precious stones. Be sure to get a broad selection and pick up more than you need. I'm having four in attendance for this year's Ostara ritual, so I grabbed five stones. If you don't have a local metaphysical store, there are several places you can purchase them from online, including many stores that have partnered with Amazon.com. 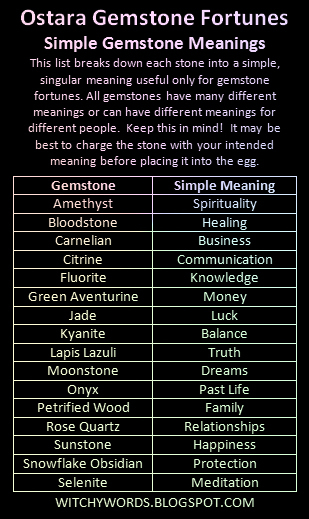 As I noted on the chart, each stone has many different meanings. The less stones you use, the more meanings of a certain stone you can use. Having four attendants and five stones means I can use two definitions of each stone's meaning. It helps broaden the fortune. You can also substitute the appropriate stones for stones you're unable to find or have access to. I would highly suggest charging each stone with the specific intent before putting them in the egg. Also be sure to create small paper cutouts that describe what each stone means in case other members are not aware of your intent when you charged them. Because I will be participating, I had my husband put the stones and eggs together. However, I've done it on my own before. 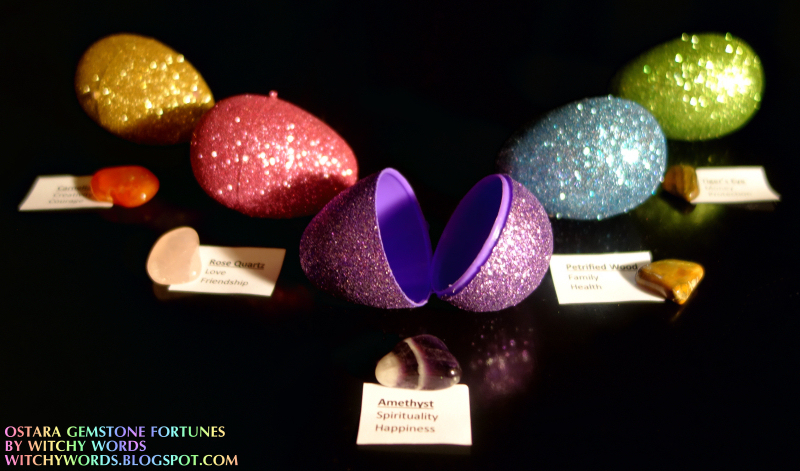 If you'd like to participate in your own fortune drawing but don't have a pair of hands, I've found a blindfold method is the best way to put all of them together without you being aware of the egg color and stone correspondences. In this case, I set out all off my stones well spaced on a table and on top of their description paper slips. I then mixed the plastic eggs in a bag. I put the blindfold on and carefully drew an egg from the bag, opened it, felt for and put a stone and paper in the egg. Once done, I placed that egg in a separate bag or basket. This is a great idea! And in addition of being a fortune, it also makes a great and meaningful gift. I think that's a perfect idea for solitaries! Thank you so much! Thank you! As wonderful as they look, they're actually kind of a mess. I expected glitter everywhere, but I didn't expect the glitter coating to chip off. That's what I get for buying Walmart eggs! I'm actually forming a new circle with two members of COT who also decided to break away and another friend. 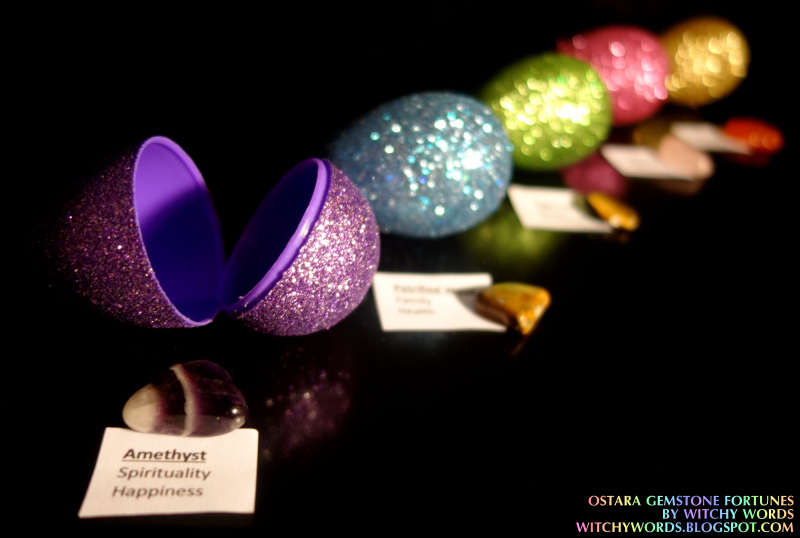 We're having our first meeting on Ostara this week. As soon as we have a name, I want to start talking about the steps we're taking in forming our circle here. Thank you again for your comment! I love this idea! I never would have thought of this, too bad I'm a solitary. Still, I'll keep this one in mind. Thanks! Thank you! Walks with Wolves above talked about placing various stones in a basket, mixing them up and drawing from that as a solitary. I thought that was a keen idea. You're very welcome! Thank you for reading! Lovely idea. Glad I found your site. Quick question out of curiosity, but is it ok to store stones together? Such as in a canister when not in use for spells? I'm relatively new and have gotten quite a bit of conflicting information about it from different paths. I feel that I share a lot of your views and am curious as to how you store your stones and crystals.